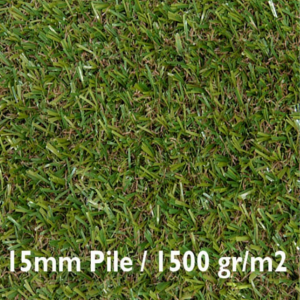 Balcony 15mm – Our lowest priced artificial grass, Ideal for a perfect lawn at a budget price, the backing is the same as our longer pile grass, just the pile is shorter for that just cut look. Available in 4m & 2m widths, roll lengths up to 25m are available. A blend of 3 beautifully coloured pile types, including realistic dead grass look. Super soft, feeling underfoot without feeling hard or course. New unique blade recovery design (won’t flatten). Easily cleanable by simply hosing down. Pet and child friendly making it ideal for dog owners or childminders. Guaranteed for ten years against manufactures defects. Ideal for residential use, can be used in multiple situations such as lawns, patios, walkways, summerhouses, around caravans, hot tubs, pools. Always make sure you ask for grass weights before buying, this is a good indication of quality. Beware of products with no specification.